As General Motors Celebrates its 100th anniversary this year, I thought I’d research two souvenir buildings related to this company. The first is a large, 6” long and 3.5” tall, lead replica from the 1930s or 40s. On the front base is the word “Chevrolet” and on the back it reads “General Motors Building Detroit” Most I have seen have a dark or black finish, but I’ve also seen them painted gold. I reached out to GM’s historians to find out more about the souvenir building: When was it made, why were they produced and how many were created? Larry Kinsel of GM Communications wrote back: “Unfortunately, I've not been able to locate any information about the replica. We have received inquires before about these same pieces and were unsuccessful then as well. In fact I'd love to get my hands on one! I've checked with several sources here at GM and no ones seen the replica before. Sorry, I wish I had better news.” It seems that other, probably from the SBCS newsletter, have contacted them over the years requesting information also. The real building was completed in 1923. The original mammoth General Motors headquarters building is now called the “Cadillac Place.” Located at 3044 West Grand Blvd. 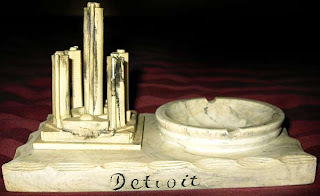 in Detroit, it housed the company's world headquarters from 1923 until 1996. Rising 220 feet, the 15 story-structure has 31 elevators and was originally constructed with 1,200,000 square feet, but was later expanded to 1,395,000. Designed by architect Albert Kahn, each of the four-parallel wings connects to a central perpendicular backbone. Kahn used this design to allow sunlight and natural ventilation to reach each of the building's eighteen hundred offices. The stately structure is crowned with Corinthian colonnades. When it opened in 1923, it was the second largest office building in the world and symbolizes the power, prestige and scale of one of the largest manufacturing corporations in the world. Created to house a wide scope of activities under one roof, the building also contains an auditorium, exposition halls, as auto display rooms, shops, gymnasium, cafeteria and lounges. The limestone-faced, steel-frame structure is an example of Neo-Classical architecture.When GM moved its HQ in 1996 to the Renaissance Center, it sold the magnificent b uilding and it’s now leased by the State of Michigan on a long term basis. In 2002, the building was thoroughly renovated for the State of Michigan and renamed it Cadillac Place. Currently, it houses over 2,000 state employees, the Michigan Court of Appeals for District I and the Detroit office for Michigan's governor. The second souvenir building is a replica of GM’s current headquarters, the GM Renaissance Center. It's a marble-looking resin from what I can tell with an ash tray to the side. The GM Renaissance Center, originally named the Renaissance Center and nicknamed the RenCen, is a group of seven interconnected skyscrapers in Detroit, Michigan. Located on the International Riverfront, the complex is owned by General Motors and serves as its world headquarters. The central tower, called the Detroit Marriott at the Renaissance Center, is the tallest all-hotel skyscaper in the Western Hemisphere and features the largest rooftop restaurant, Coach Insignia. It has been the tallest building in Michigan since 1977. John Portman was the principal architect for the original design. The first phase constructed a five-building rosette, with a 73-story hotel surrounded by four 39-story office towers. This first phase officially opened in March 1977. Two additional 21-story office towers opened in 1981. This type of complex has been termed a city within a city. In 2003, General Motors completed a $500 million renovation for its headquarters in the Renaissance Center, which it had purchased in 1996. The renovation included the addition of the five-story Wintergarden.The Renaissance Center totals 5,500,000 square feet making it one of the world's largest office complexes. Do you know of other miniature building versions of these two structures? If so, let us know via the ‘comments’ link below. I don't know if this will help your research or not, but my grandfather, John T. Carter, was a salesman for GM or Chevrolet in Georgia and he brought back two of these miniature buildings from a sales convention in Detroit in 1936. I have a picture of that meeting and I believe the date is correct, but I don't have the picture with me. One of the buildings is in very good shape. Hi John, Thanks for the info and date. 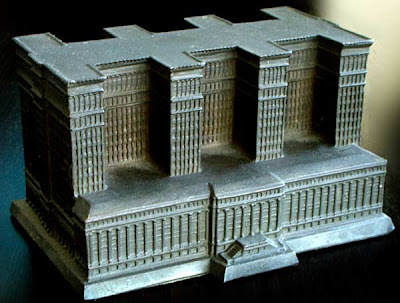 Do you believe the miniature buildings were given away to all salesman at that convention? Always fun to know the history of the miniature replica itself. I have discovered one of the miniature buildings you describe in some of my grandmother's belongings. The story is that she was given this for providing her labor to GM at wartime while men were gone. That is what was remembered ?? Ewing Chevrolet was a franchised Chevrolet dealership from 1914-2007. My grandfather had one of these replicas in his office for many years. I have it in my collection today. I could believe this replica was given away to those dealers/dealer's representatives at a dealer meeting held in Detroit in 1936. My guess would be that it was during the new car announcement meetings that were held there in the late summer or early fall of the year. Ewing Chevrolet constructed a new large Chevrolet dealership in Canton, Ohio in 1936. Since both Charles C. Ewing and his brother Floyd C. Ewing were dealer principles at the time, I would guess they received this model at that meeting. My father Stanley C. Ewing succeeded my grandfather and I succeeded my father as dealer principles for Chevrolet in Canton.